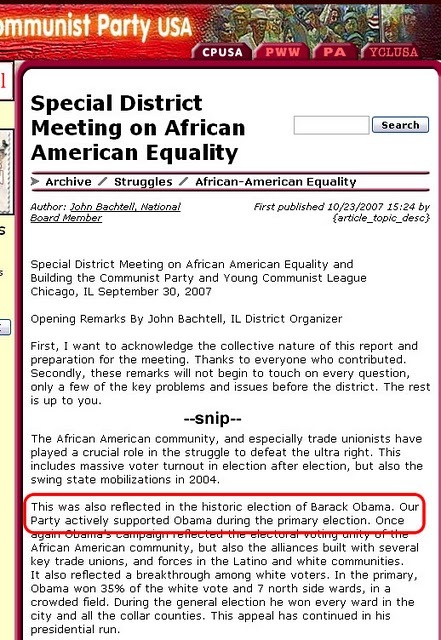 From WND.com, by Aaron Klein, 08/03/2011 – It may be early in the campaign season, but the Communist Party USA already has seen fit to endorse Barack Obama for the 2012 election. 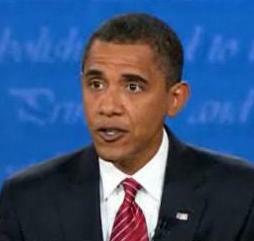 Barack Obama at a presidential debate at Hofstra University in New York. Get “The Manchurian President” AUTOGRAPHED only at WND’s Superstore! Webb, however, recognized that such a party is not likely to emerge by next year. “Millions who have to be at the core of this party still operate under the umbrella of the Democratic Party, albeit increasingly in an independent fashion,” he noted. Webb said that for communists there are major differences between Democrats and Republicans. He urged his supporters to continue to back the Democrats. Last November, the Communist Party USA was caught scrubbing its website of references that stated it “actively supported” President Obama’s election, as WND reported. WND previously reported the official magazine of the Communist Party USA had lauded the important role of labor unions in electing Obama to the presidency in 2008. The American Federation of Labor and Congress of Industrial Organizations, or AFL-CIO, sponsored a poll showing union members supported Obama by a 68-30 margin and strongly influenced their family members. According to the survey, Obama won among white men who are union members by 18 points. Union gun-owners backed Obama by 12 points, while union veterans voted for Obama by a 25-point margin. In the general population, Obama lost these groups by significant margins. Political Affairs, the Community Party USA’s magazine, quoted AFL-CIO President John Sweeney, a longtime member of the Boston chapter of the Democrat Socialists for America, expressing hope labor unions can continue working with Obama. Immediately following the November 2008 presidential election, WND reported the Communist Party USA mapped out policies crucial for Obama to push through in his first term, including a “single payer” socialist health-care system; laws to make joining a labor union easier; raising the minimum wage and increasing labor union support. In May 2009, WND reported the leader of the Communist Party USA declared that with Obama as president, health care and the economy can be “reformed,” U.S. troops can be evacuated from the Middle East, a second stimulus bill can be passed, the criminal justice system can be overhauled and union rights can be expanded. “All these – and many other things – are within our reach now!” exclaimed Webb in a New York banquet speech for the People’s Weekly World, the official newspaper of the Communist Party USA.